The JSB: If you stalk a creep, what does that make you? If you stalk a creep, what does that make you? If there was item out there involving Britney Spears and irrational and delusion behavior -- but the craziness wasn't emanating from Britney -- I'd, out of fairness and a sense of irony, have to post it. Same goes for the following tidbit involving Michael Jackson, who is a good deal more prone to creepy behavior than your average former king of pop. Earlier this week a woman was arrested for trespassing on Michael Jackson's Neverland Ranch. The woman has been identified as a stalker who has been tracking Jackson for at least 20 years. The woman's name according to the police record: Billie Jean Jackson. As many of you know Michael Jackson's classic album Thriller turned 25 recently. 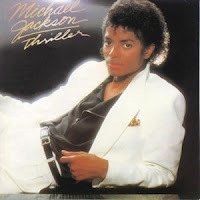 And Thriller's signature tune was Billie Jean, a song about a woman of that name who stalks the song's protagonist -- claiming that she is his "lover," even though she is "not." Which begs the questions: Which came first, the stalker or the song about the stalker?